This is a question that pops up in our mail box on a regular basis. The standard answer for the average retail buyer who has neither the time nor the inclination to do the hard yards, in terms of due diligence, is to layer-in your acquisitions via a rolling programme of purchases. This can be implemented regardless of the day to day 'white noise' that has many behaving as though they had spent the morning in a double shot Expresso Drinking Contest. Sell, Buy, Buy, Sell.... we all know that emotional white knuckle ride and it needs to be side lined. Try Chill, Relax, Relax and Chill for a day or two and switch to a herbal tea. Silver is often described as 'poor man's gold' a second class citizen in the world of precious metals, how preposterous. We will concede that it is indeed cheap at the moment, however, in a few short years the uninformed will be shrieking “How much” as they try to come to terms with just how fast and how far silver has traveled. Silver has many uses, not just decorative as in jewelery but it also has industrial and medical uses as it is top of the class in terms of conductivity of light and electricity. It is easy to work with and can be shaped to almost any requirement. Silver is highly resistant to corrosion and requires little in the way of maintenance. As traditional sources of energy cost more, so the need for solar panels increases, hence we have China, the biggest producer of these panels, becoming an importer of silver as oppose to being an exporter. India also sees the value in silver and is also a major importer of silver. These two countries alone help to back stop silver prices. To meet demand suppliers have had to run down their stockpiles. However this solution has only a limited time scale before it becomes depleted thus limiting the supply and forcing prices up. Now if we throw in the constant devaluation of currencies worldwide then we start to get the picture of why silver prices have moved up from $4.00/oz to $33.00/oz. Silver is a store of wealth and a hedge against inflation similar to its big brother, gold, however, we think that it has an edge over gold. Silver is being consumed, gold for the most part is being stored. By comparison to gold the silver market is tiny, so when the demand heats up and the general public finally take an interest, the rush will look like a wild west land grab. From the outset of this bull market we have maintained that silver will outperform gold and we see no reason to change our stance. 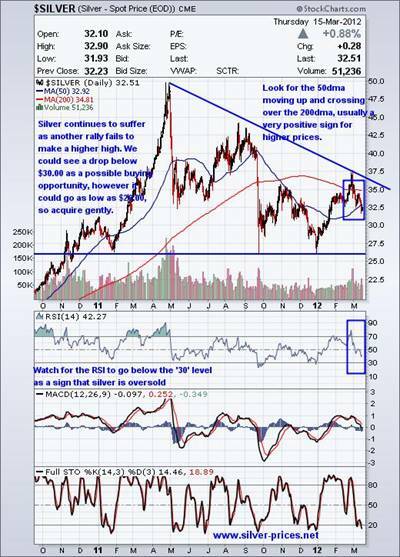 Also note that the ratio of gold to silver is 51:1, during the last bull market when gold hit $800/oz, silver hit $50.00/oz, a ratio of 16:1, should this event re-occur then we could soon be looking at $500.00/oz, it wont be a 'poor man's anything' then. With that scenario in mind we could argue it doesn’t really matter what you pay for silver today. Now, for those of you who watch gold and silver so closely that your eye balls dry out and your eye lids are locked in the open position, we will give our short term 'take' on the situation. Taking a quick look at the chart we can see that silver is struggling to gain any traction in terms of meaningful progress, as another rally fails to make a higher high. Look for the 50dma rising and crossing over the 200dma, usually a very positive sign for higher prices, also watch for the RSI to go below the '30' level as a sign that silver is well and truly oversold. Finally, the dollar, the Euro and the UK Pound are toast looking for their final resting place in a world where they are no longer trusted as a store of value. This is how we see it, but its your hard earned cash and its your choice, so please read as widely as you possibly can in order to position yourself safely in this rapidly changing economic environment. To stay updated on our market commentary, which gold stocks we are buying and why, please subscribe to The Gold Prices Newsletter, completely FREE of charge.